If you’ve never seen a ghost, sit in a parking lot outside a mall in the U.S. and look at your fellow Citizens walking around pretending they have problems. 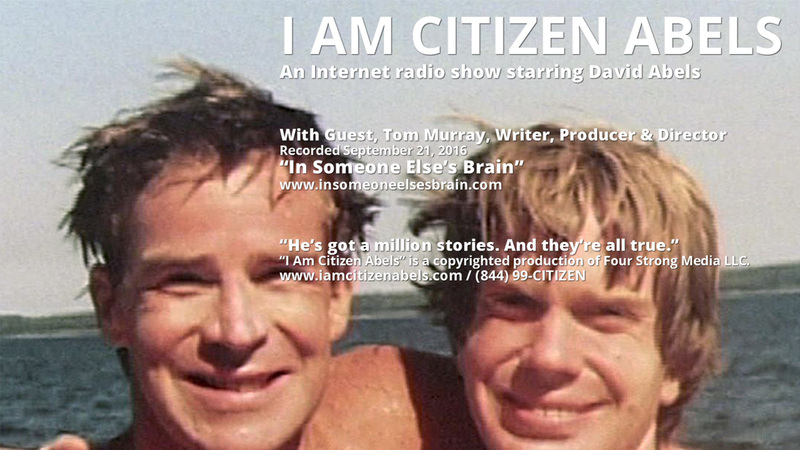 But after this episode of “I Am Citizen Abels,” entitled, "In Someone Elses's Brain," The Citizen is feeling like the problem is you. We sit and complain – standing around like furniture like Bob Dylan has said – and wonder why our lives are so terrible. Meanwhile the sick and the hungry and the old and the poor and the dead and dying in all of our grand wars lay there waiting. Tom Murray is a filmmaker, and his film about his brother, Chris, called “Dad’s in Heaven with Nixon,” is a must-see documentary, not because it’s about autism or art or success or life, but because it’s about a family’s love and sacrifice for someone, and a mother whose undying devotion to her son is an embarrassment to the rest of you sad saps. So listen as The Citizen cries like a girl, and remembers he ain’t giving up on his kids or any other. Look. Listen, you idiots, and wake up, everybody. "In Someone Else's Brain" was recorded September 21, 2016.